Be the first to share your favorite memory, photo or story of Leon . This memorial page is dedicated for family, friends and future generations to celebrate the life of their loved one. 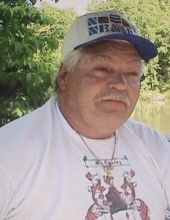 Leon McCauley, age 76 of Frankston, passed away Thursday, April 11, 2019 in Palestine. Leon was born March 4, 1943 in St. Jo, Texas. He was a welding inspector in the oilfield industry. Mr. McCauley was preceded in death by his mother, Edna (Chaney) Frye and twin brother, Leonard McCauley. Left to cherish his memory are his wife, Linda McCauley of Frankston; daughters, Jessaca Kordsmeier and husband Andy, Vanessa Smith, all of Tyler, Rita Sanchez and husband Franky of Waxahachie, and Amanda Tucker and husband Richard of Dallas; sons, H. Leon McCauley and wife Brandy of Maud, and Brian Fugett and wife Brandi of Waxahachie and James Fugett of Red Oak. He is also survived by 15 grandchildren, numerous great-grandchildren, and several nieces and nephews. "Email Address" would like to share the life celebration of Leon McCauley. Click on the "link" to go to share a favorite memory or leave a condolence message for the family.